← FrostWire – Is it a LimeWire Killer? Mozilla Firefox is one of my most beloved open source software. If you are a regular reader here, then it’s no secret. I recommend and sometimes even install Firefox anytime I see a friend or a family member using IE. Firefox is awesome because you can make it into something more than a browser with the numerous extensions available. You can make it into a swiss-army knife of blogging, web development, writers tool, or just plain fun with the right set of extensions. You can check out my neatly categorized list of Top Firefox Extensions to see what I mean. With all this power comes difficulties to regular users and that is one of the main reasons for Firefox spreading slower despite its obvious benefits. Mozilla has taken that into consideration and is smartly offering real time Firefox Support through Live Chat! It is totally supported by volunteers which means you and I could help Mozilla out. At the moment, support is only provided in English. Since this is supported totally by volunteers, the hours are limited at the moment and will expand as they add more people. 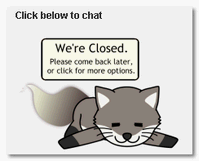 If you see the cute Foxkeh say Live Chat is open, you can jump right in to get support. Next time you install Firefox to someone you know. make sure you bookmark this link for them so they can get some help if they have questions. Of course, you can feel free to drop me a line anytime if you have questions about Firefox too and I will absolutely do my best to help you. Even if I didn’t know the answer, I will sure try to find the answer for you. Another great find! Even though I was not within the posted hours of operation Phillip was online and helped me with an unusual problem. Although we were not able to solve my problem I learned about starting FF in safe mode and I was given a resource page to help solve my problem later. I was just googling and came across your site, i found it very interesting and will spread the word to my friends, cheers ant.